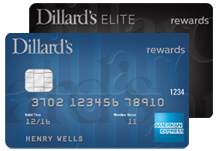 The Dillard’s Elite Amex card (see my review of the card here) has been tweaked a bit by Wells Fargo since Wells took over that card from Synchrony last year. The way to get the Dillard’s Elite Amex is to start off with a regular Dillard’s American Express and spend $2,000. Previously, it was possible to spend $5,000 and receive some undisclosed vacation benefit. The T&Cs were vague and there was little information about the specifics on the interwebs, so that benefit will always remain a mystery to me now that it’s apparently been removed. Visit American Express CONNECT and take advantage of special amenities! NATIONAL CAR RENTAL Enroll and enjoy an upgrade to Emerald Club Executive status plus additional savings. COMPLIMENTARY AMENITIES At nearly 1,000 luxury hotel properties around the world. Periodically a blog or a forum will post a super top-secret link where you can upgrade to Emerald Club Executive. If I recall correctly the links are supposed to be for high-end credit card holders except they make it out into the wild without a system to prevent any old Joe Internet or Sally Broadband from signing up. Am I correct in assuming a lot of you reading this already have Emerald Club Executive status? I’m pretty sure I do, but I hardly ever rent cars these days so I don’t know for sure. I was not familiar with American Express Connect. The #1 result when you google “Amex Connect” is an Australian Amex site, so I don’t know if it started there or what. Here’s the Amex Connect login for the Dillard’s Elite Amex site, and you can enter 1866834 (that’s the first seven digits of the customer service telephone number, not a unique ID) to enter the website and have a look for yourself. So is American Express Connect worth it? You tell me. Non-travel benefits for the Dillard’s Amex Elite glitterati include free shipping or giftwrapping, plus invitations to “private shopping events.” Yawn. The full T&Cs are here for anybody who’s curious. Unless somebody there’s a compelling reason to be a part of the Amex Connect program, I’ll pass on working for elite status. It’s not letting login with those numbers. Are you sure? I just tested those #s again to be sure, and it worked. Anybody else tried it? It works now, which is weird. I’m not seeing FHR offers for PHX later this month though. I think the biggest benefit of National’s Executive and Executive Elite status are the free days and the lower thresholds required to get them. If you’re not renting much, you won’t get free days — if you are, you’ll get them (and the status) anyhow. So yeah — it’s kind of meaningless, but probably a good marketing move as it’s another bullet point that “offers value” even the value is largely symbolic. National is pretty good, too — so if enough people try it based on the benefit, National could get some renters who decide they prefer National over Avis or Hertz.